Custom Horseshoe Nameplate - - made from Solid Red Oak. 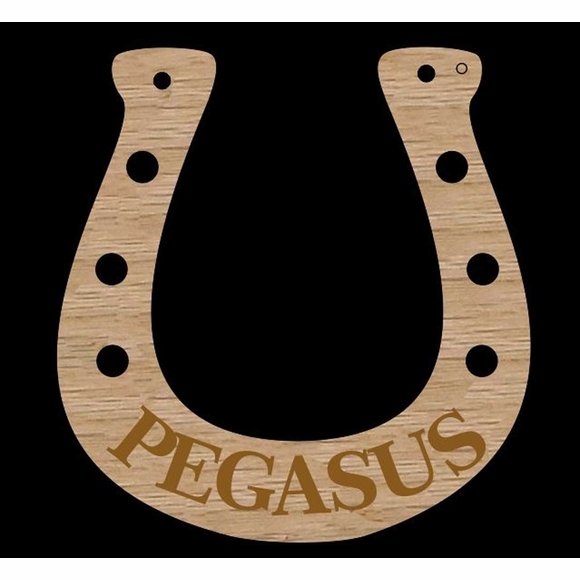 Designed for use on a stable door, a horse stall, or even on the wall of a horse owner or breeder. Personalized with a horse's name. If you think of the horseshoe shape as a cup and the heel faces upward, the horseshoe fills with good luck, holding it for everyone (human or pet) who lives nearby. This Comfort House name plate will surely fill with good luck for you and yours. Solid red oak wood nameplate with decorative typical horseshoe nail openings. Finish is smooth sanded wood and can be used as supplied or you can stain it to match your local decor. Personalization: holds up to eight (8) characters in an arc. Includes two (2) 0.187" screw holes and stainless steel mounting screws. Size: 6.375"W x 6"H x 0.5". A Comfort House exclusive, this is the horseshoe nameplate for stable doors and horse stalls. It's the perfect gift for horse breeders and horse owners.